The picture was taken nearly 37 years ago. Why are humans not still there? 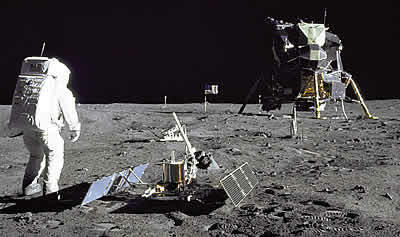 The United States pulled off the greatest feat of engineering and exploration in history, and then abandoned the Moon. Once there, they should never have left. Now it will take yet another decade to make it back, while the imagination-free scream 'Been there! Done that!' and 'Waste of tax-payer dollars!' etc. Many of the same people have no problem at all watching countless billions being poured into the black hole of the US military to wage unnecessary or imaginary conflicts of their own creation. A fraction of the military budget would put humanity back on the the moon and on Mars. And would be a better use (duh!) of the money. The next 'giant leap for mankind' is inevitable (as long as a wandering 10km wide asteroid doesn't take us out first). The problem is getting politicians now to fund something that is not of direct benefit to their re-election strategies. Any true commitment would not bear fruit for decades or even centuries.